All our recipes are full of the nutrients dogs need to stay fit and healthy, but giving your dog the right amount of food is really important. We’re here to help you get it right. Our dry food feeding guide and wet food feeding guide can help you work out how much food your dog needs, based on their weight. All dogs are different and the amount they need to eat will vary depending on their age, environment and activity level – but please don’t give them more than the recommended amount. Once you’ve checked how much food your dog needs each day, split it into 2 meals. If you’re feeding a puppy, they’ll usually eat small amounts whenever they need to, so until they’re 6 months old, split the recommended amount into 3 or 4 equal meals. How can I tell if my dog’s eating too much? A big appetite isn’t necessarily a bad thing, as long as your dog burns off the calories he or she eats. If you take your dog running or hiking, they’re going to feel hungry sooner, just like you would. 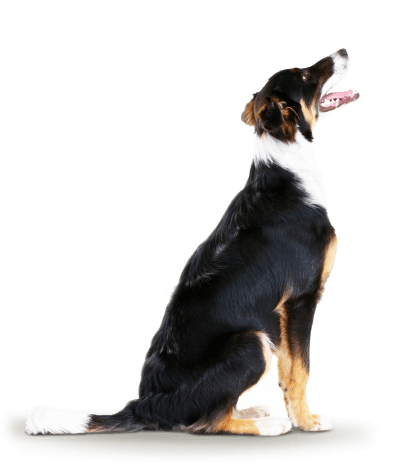 Most dogs should have a small, evenly spread layer of fat under their coat, but you should still be able to easily feel their ribs and see their waist when you look from above. If you’re not sure whether your dog’s eating the right amount, or a healthy weight, always talk to your vet. How do I get my puppy started on Collards? We’ve created Collards Puppy with vets and nutritionists to help the youngest dogs grow up healthy. It’s designed to be used from weaning until they’re a year old. If your puppy is under 3 months old and not used to dry food, start by mixing it with a little warm water. As with any new food, it’s a good idea to introduce it gradually over about 4 days. Puppies often eat smaller amounts, more often than older dogs, but throw away any wet food that they haven’t finished after three hours. Make sure there’s clean water in their bowl all day too. How should I store my dog’s food? Store all unopened food, and any open dry food, in a cool dry place. Once wet food has been opened store in a lidded container within a refrigerator and consume within 24 hours. Best served at room temperature.